Following in the footsteps of an industry legend – in this case, Jim McEwan – is no easy task. 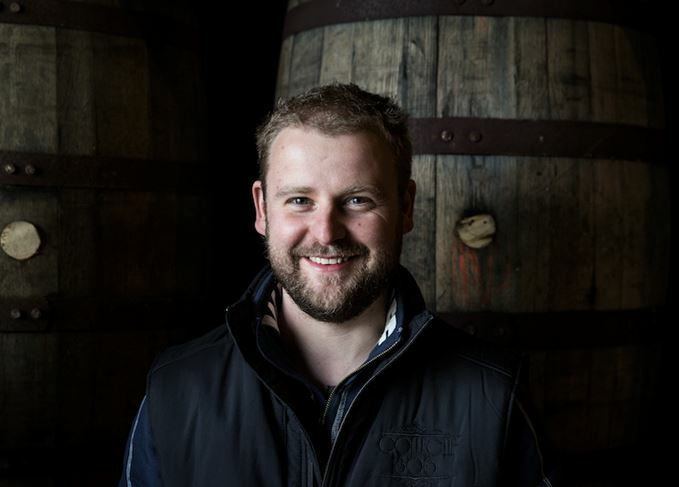 But Bruichladdich head distiller Adam Hannett is determined to carve out his own niche at the maverick Islay distillery, as Gavin D Smith discovers. ‘Mum and dad were from Manchester and trained as nurses. They fell in love with Islay while on holiday and moved here in the 1970s. I was brought up at Ardnave House in the north of the island, which was a fantastic place with great beaches to play on. ‘I did a year-and-a-half at Aberdeen University studying marine biology but I didn’t really know what I wanted to do and wasn’t that keen on studying, so I left and came home when I was 20. Distilleries weren’t open to the public so much when I was growing up; they were much more secretive and mysterious in the 1980s. But things had changed by 2004 when I got a job at Bruichladdich working in the shop and conducting tours. ‘I had a pep talk at the start by Jim McEwan and was absolutely hooked from that point on whisky and whisky-making. I worked in the warehouse and did shifts at mashing, and before Christmas you’d stop the stills and everyone would be pulled into the bottling hall to get stock out. There’s not a job I haven’t done in the distillery. ‘Working with Jim and the now retired general manager Duncan McGillivray, I was like a sponge soaking up everything. I call myself head distiller – certainly not master distiller, as Jim was. Maybe one day, but I definitely wouldn’t be comfortable with it now. ‘Every day working with Jim was amazing. You learnt how to conduct yourself as a person for one thing – after all you were representing the distillery. There were no short cuts and it was all about quality and achieving the very best possible. ‘None of our whisky goes into blends; it’s all bottled as single malt, so it has to be right. Integrity and telling the truth in front of people is vitally important. You also have to have a bit of fun and not take everything too seriously. ‘How do you follow Jim? He was very good at coaching me, telling me to be your own man, do things your own way. That was reassuring. I tried not to think about following in Jim’s footsteps at the first festival masterclass I did. Jim was passionate and flamboyant, a great performer. I’m a bit more sedate! ‘I have a great team around me, including Allan Logan, our production director, who has worked his way up through the ranks and is a really good guy to work with. He’s very calm and knowledgeable. Everybody’s pulling in the same direction. ‘In terms of what we’re doing, it concerns keeping to fundamental principles. We’re passionate about our barley and casks – about sheer quality. We are curators and we are not planning radical changes. The distillery is in fantastic health, and we’ll improve where we can. ‘We’d love to malt here, it’s the missing part of the jigsaw, and we are exploring the feasibility of that. However, we have made some Octomore and Port Charlotte with Islay peat, which we shipped to Baird’s Maltings at Inverness for them to use for us. ‘Octomore 07.4 Virgin Oak was my very first expression with the stabilisers off, as it were. It was Jim’s idea to do it, but I actually made it and it’s an absolute flavour bomb. I’m currently working on Black Art 5, and I’ve also done Port Charlotte 2007 CC.01 in Cognac casks, and Laddie Eight for travel retail, which is a new market for us. I decided an eight-year-old would be interesting. ‘The Cognac casks give the Port Charlotte an amazing sweetness. We just filled them and laid them down to see what would happen. We didn’t even necessarily have it in mind for release until we saw how well it turned out. ‘There’s been an assumption that because The Classic Laddie was an NAS expression it would be inferior to some of our other whiskies. About a year-and-a-half ago – long before the whole “transparency” issue with John Glaser and the Scotch Whisky Association came to the fore – we had the idea of putting codes on bottles of The Classic Laddie so that buyers could visit the website and find the recipe for that batch. We decided it was really time to do it when the whole Glaser issue arose. ‘We plan to do the same coding for Port Charlotte Scottish Barley, as essentially it’s the Port Charlotte version of The Classic Laddie – but nobody’s going to find out what goes into the Black Art I’m making! ‘When it comes to my own drams, I’m really enjoying Port Charlotte Scottish Barley just now, and I’m also a big fan of Ardbeg and what they’ve been doing. The heavily-peated single malt from Bruichladdich is introducing four new whiskies this summer.